Female Religious Fanatic: Sanctify my body... Give me your golden staff. God said it's okay. A nice, funny, underrated little movie. 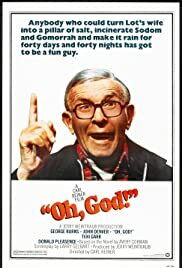 "Oh, God!" is similar in many ways to "Bruce Almighty," but for some reason the former has gotten little attention over the years while the latter was a hit. While "Bruce Almighty" has some funny moments, I think this one is far superior. 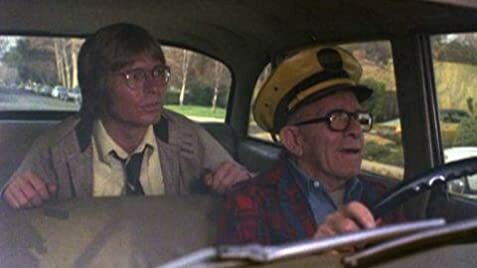 First of all, George Burns is amazing. Morgan Freeman's God in "Bruce Almighty" had a slightly ominous, don't-cross-me nature, but Burns' is a God you can completely trust. He is caring and optimistic, and wants the world to get better. He doesn't throw Jerry into a situation he can't handle; he is there for him the whole time. Plus he is just a really fun guy to be around. Who wouldn't want to believe in a God like that? John Denver also does a great job. It is hard to believe he had no acting experience before this, because he is top-notch. He is a kind, honest guy, not a selfish jerk like Jim Carrey's Bruce Almighty. He is nervous about delivering God's message to the world, but perfectly willing to do it. Unlike that other God movie, this one delivers a good message without getting annoyingly preachy, it is consistently funny from start to finish, it has a likable main character, and it features a God who is a friend, not an opponent. I think everyone could enjoy watching this, whether they are religious or not. Oh, and on a completely irrelevant note, I think Carl Reiner's cameo (doing an impression of the portrait of Dorian Grey) is one of the funniest things I have ever seen. That scene alone is reason enough to watch this movie.